The end of June, the end of the financial year and half way through 2009. While it only seems like yesterday that we left Bundy and made our way south and up to the NT, we have at the same time seen and done so much this year already. This update will be short and sweet as while we have been having an absolute ball up in Kalumburu there is not that much to report. We completed our first six weeks in Kalumburu and then had to clean up the house and shift next door for our last two weeks. While it was a bit of a pain, as we live out of plastic boxes, the relocation was not too bad and was all over in a few hours. Unfortunately the cleaning process did take longer. We have really enjoyed the lifestyle in Kalumburu, the social aspect, getting to know the locals, both indigenous and white, and of course the weather. It has remained hot, averaging 35c during the day and only slightly cooler at night. Jumpers or long pants are not even remotely needed. This climate is very hard to beat. We have been busy on the weekends visiting those 'hidden jewels' around the area. Life has been very busy and social. We met a family (Jamie, Marnie and the kids) in Cape Range on our way up here a few months ago, who have been travelling for a bit over a year. They were making their way to Kalumburu as Marnie's parents are volunteers at the Mission. They have been here for the entire month and it has been good having them around. Chris has picked up a few days a week teaching at the local school so the boys also attend on those days. Chris is really enjoying the school and the local kids and of course the social aspect of working and getting out of the house. The boys have to continue their 'other' schooling so the working thing has increased the work load at home a bit. 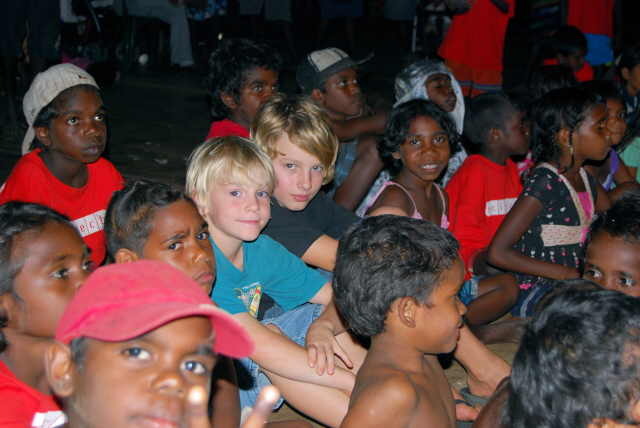 The local kids generally are a nice bunch and have taken to our little blondies. Once again the boys have had no trouble at all while at school, although Harry does think it is a little boring. There is certainly more 'behaviour management' than teaching happening most days. Whether our kids actually learn anything at school really is academic (excuse the pun), its all about the experience of actually being there, the two little white faces (and the only ones) amongst the many. 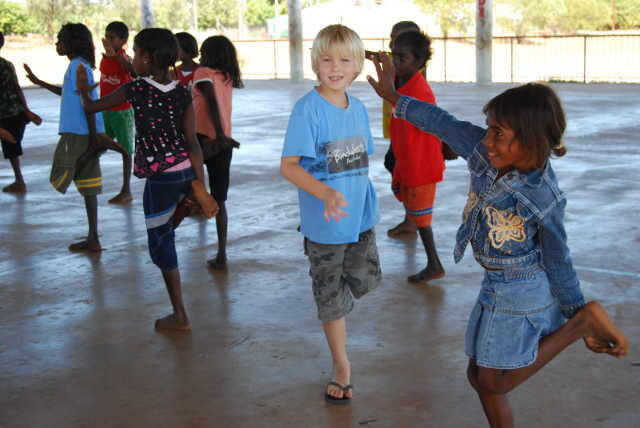 As with any aboriginal community there is a constant flow of white people coming out to the community for many and varied reasons. So far the kids have spent time with the 'Scitech' travelling science classroom which they really enjoyed and then spent a week learning 'Hip Hop' dancing with another visiting group which culminated in an evening concert in the undercover area opposite our house. All the kids did a great job with the two little white boys stealing the show with their own 'local' fan club. It was funny hearing the local kids yelling 'Alex, Alex, Alex'. I don't think they had ever seen anybody dance like him before. I am not sure I ever have either! Alex has been nicknamed 'Alex the Lion" and Harry, 'Harry Potter'. It was a good fun night in downtown Kalumburu. Next is Auskick which they will also enjoy. Work at the Clinic is more fun than hard work. The locals are a very nice bunch and not at all demanding, as they have been in some of the communities that we have worked. After Hours call is almost non-existent which is great. As we can travel up to 20 kms away while on call we still can get out and about and just leave a note on the door at home. We did have a little action a few weeks back. About mid-morning we received a call that a tour bus had rolled over on the road to Mitchell Falls and we were requested to respond. By the time we arrived, which was a three hour drive, the RFDS had arrived at the Mitchell airfield and had seconded the help of two helicopters. The tour operators had set up tarps with the injured on camper stretchers. With a few trees cleared and the choppers parked only a hundred metres away it did look a bit like an episode from 'Mash'. All the hard work had been done by the time we arrived so it was just a short break, a few photos and then time to turn around for the 3 hour drive back. It really does highlight just how remote it is out here and how much you are on your own. From the time the bus rolled to first contact by medical help would have been between 4-5 hours. That's remote. 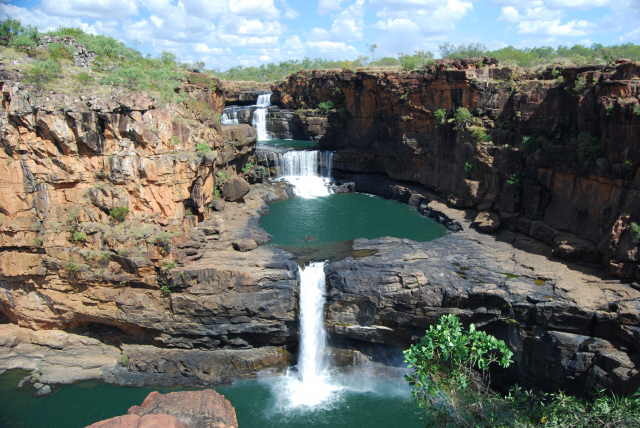 One of the highlights of the month was a long weekend away to Mitchell Plateau and of course the famous Mitchell Falls. We had a post-grad nurse (Tash) working with us at the Clinic for 2 weeks as part of her post-grad rotation so we invited her along as well. She was really excited as the falls were something she also really wanted to see. We got away Saturday morning and made our way down to the Kalumburu / Mitchell Road turnoff and headed north along the 85 km drive. Crossing the King Edward River was uneventful with it only being about 600mm deep. The road into the falls was in good condition, but with time it will deteriorate. The camping area at Mitchell Falls is great despite all the negative comments we had heard. Huge areas, shady and brand new spotless toilets. The helicopters do take off and land close by, but do not disrupt the peace and quiet as they take off away from the campground. Saturday we spent setting up and relaxing before the big walk the next day. We had decided that we would helicopter it into the falls and walk out. After checking out the prices, (which of course were as cheap as!!!! Yer right! 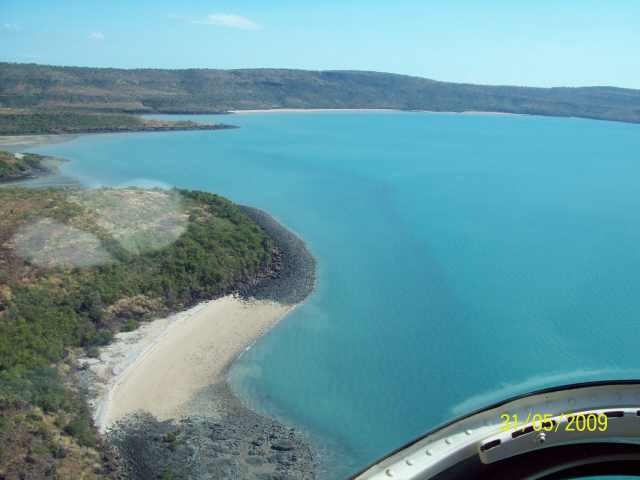 ), we decided on the 50 minute coastal flight. While it did cost over $1,400-00 for us all it was a great experience. With no doors on the chopper we headed out to the coast and over the archepeligo before travelling up the Mitchell River with a few figure of eights over the falls. There was still a huge amount of water flowing over the falls and the view from up there was hard to beat. While it is expensive, it really is a must do as the view cannot be reproduced from the ground. We landed at the top of the falls and then spent the remainder of the day exploring and photographing the falls from ground level. It was as hot as but luckily there are heaps of places you can safely swim up there. As you can see from the photo above Alex has discovered some new powers. 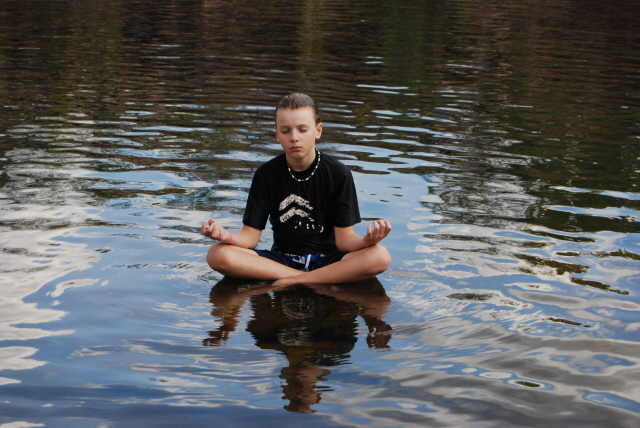 He may not be able to walk on water, but he certainly can sit on it. By mid afternoon we began the 1 hour walk back to the campground that took us about 3 hours as we kept stopping to either explore or swim. 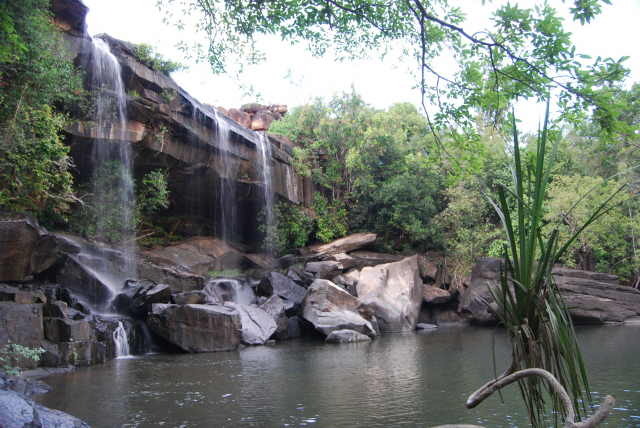 Little Mertens Falls, which are only about 800 metres from the campground, are beautiful and great for swimming. We arrived back at the camper exhausted having had just the best day ever. Next morning we packed up and headed back to Kalumburu. The drive back to Kalumburu was anything but boring. 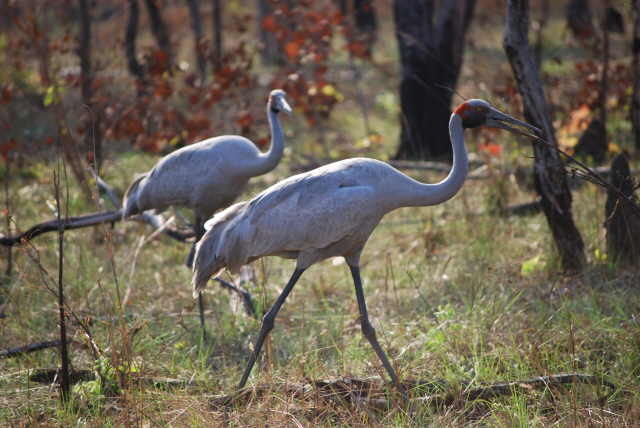 We stumbled across a flock of Brolgas (see photo below) walking along the edge of the road. While not rare, they are not commonly seen and to find 11 was a real surprise. They were not concerned by our presence and we slowly drove along with Chris snapping away with the Nikon. Then only a few kms down the road at one of the many water crossings, there sitting on the side of the road was a small fresh water croc. It was like being on safari in Africa. 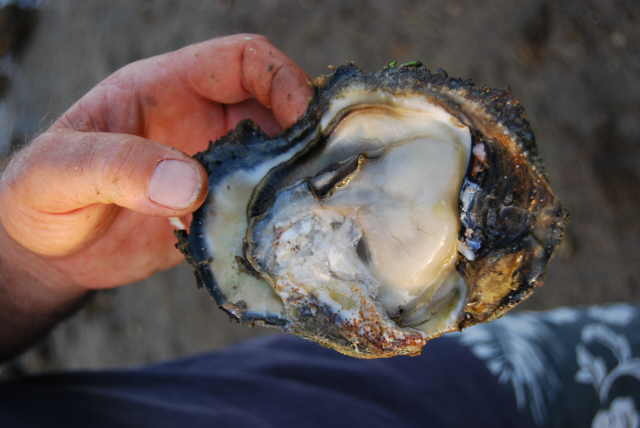 Now for those oyster lovers amongst you I must tell you about the well known Kalumburu Black Lip oysters. These are readily available off the rocks not far from our house. In no time at all you can collect a bucketful that keeps me going for a few days. The ones in the pictures are the small ones, but much better eating than the dinner plate oysters (that are as big as a dinner plate), which need to be barbequed. Bon appetit!! So while it is short and sweet this month it is again time to say bye from us. 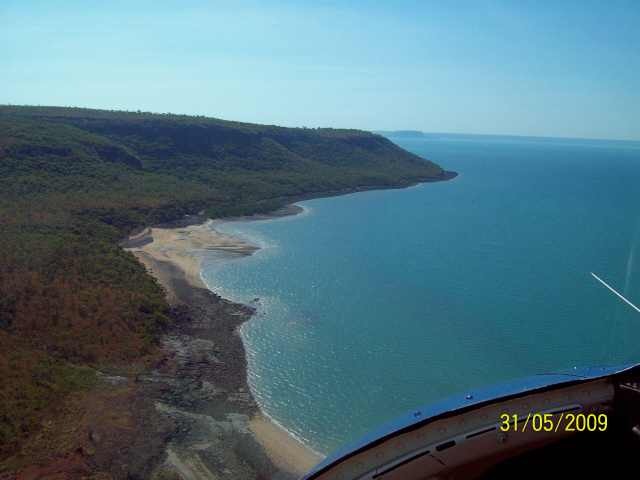 July will be very busy for us as we are heading to Broome to meet up with the Joiners who are flying over from Bundy and hiring a 4x4 and a camper trailer. 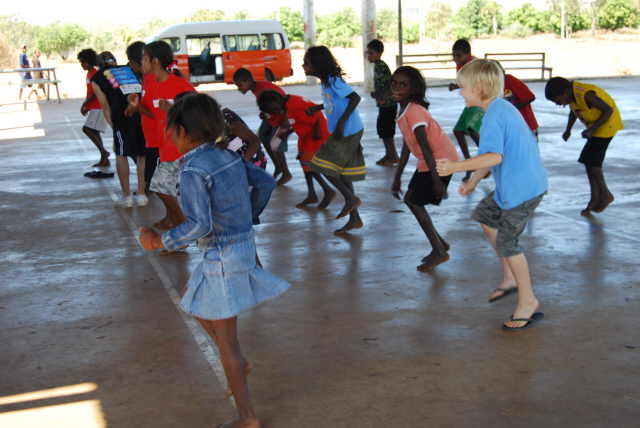 We will then spend 4 weeks exploring the Gibb River Road and surrounding area. We will then have an extra week to make our way back to Kalumburu as we have accepted another 8 week contract which will bring us up to nearly the end of September, when we will have to start making our way slowly back to QLD for our time at Cotton Tree for Christmas. So many places, So many faces, So much yet to see. Harry prepared for the 'Swine Flu'. You can never be too careful, even in Kalumburu ! !